CHEF JAMES: Many people only familiar with your background in broadcast journalism may be surprised to hear about your involvement with cattle raising. Could you tell me a little bit about your family background in Kansas and how this relates to your involvement with Sedan, Kansas and Tallgrass Beef. 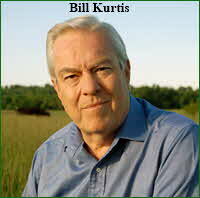 BILL KURTIS: It's true that some people find it hard to equate the Bill Kurtis of Cold Case Files with a grass rancher. In fact, I was showing a woman around my garden the other day and she said, "Mr. Kurtis...when you describe the boxwood around the David Austin roses, I keep thinking you're going to say, and that's where the body was found buried." In fact, I'm from Kansas, my parents were from there, and grandparents. I attended Independence High School, University of Kansas and graduated from Washburn University School of Law in Topeka, Kansas and passed the Bar in 1966. So, I have Kansas roots. My cousin, Jack Horton, manages the Red Buffalo Ranch. I bought the ranch 10 years ago and as any rancher knows, you have to be constantly searching for ways to pay for it. I came across grass-fed beef in my surfing the internet and felt it was a marriage made in heaven. It is good for the environment, the family farmer and the health of the American people. I dabbled in it for about five years, learning the challenges, before founding Tallgrass Beef Company around two years ago. CHEF JAMES: How confident are you that Tallgrass Beef is the future of America's Beef? Do you see a new industry evolving, separate from the mainstream beef industry, or do you feel that the mainstream beef industry itself will begin to change and adapt Tallgrass Beef and similar ranching methods? BILL KURTIS: I think grass-fed and finished beef is too good for the beef industry to ignore. We have achieved alchemy--turning red meat which the medical profession advises heart patients not to eat--into a health food. That's right, a healthy dietary product which they now recommend for all kinds of diseases, including cancer. Soon, ,I believe, you'll see the big operators embracing some kind of grass-fed program. The public will demand it. But mind you, we're not going to replace the current system because we're limited in the amount of grass available. Concentrated feeding serves a very big customer base that grew up on corn-fed, marbled steaks and prefers their taste. I view us as the alternative to corn-fed, much like decaf is the alternative to regular coffee. Starbuck's certainly didn't go out of business by offering them side by side. Sometimes you want a kick in the morning with high caffeine and other times you prefer to sleep at night. But it's nice to have a choice. There are several scenarios that could speed up the integration of grass-fed beef into the current system. Corn prices could keep increasing to supply ethanol plants which would tip the economics of grain feeding programs. If history is any guide the beef market will slide, in which case our Tallgrass Beef program will be very competitive. Those ranchers who have land with grass on it will be interested in the market we're creating. We're already hearing from many producers interested in our protocols.